Palaeontologist from the School of Earth and Environmental Sciences, Dean Lomax, has been named in JCI UK’s top ten outstanding young persons award in the category of Scientific and Technological Development. Every year JCI (Junior Chamber International) United Kingdom searches for the ten people in the UK who represent the outstanding achievements of young leaders. JCI members from across the country work with their local chambers to identify incredible young leaders who are proving that regardless of age, young people can do amazing things when they apply themselves. Dean Lomax works in the School of Earth and Environmental sciences has won this award in the category of Scientific and/or technology development. Coming from a humble background in Doncaster, Dean was interested in a career in palaeontology from an early age, but was told it would never happen given the difficulty of getting accepted into university in this very competitive subject. Dean nevertheless pursued his dreams, taking on various jobs to raise funds for field trips to the USA. 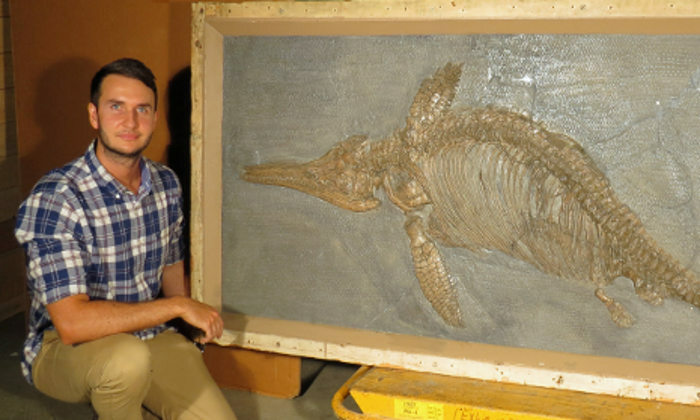 During his career, Dean has identified new species of ichthyosaurs, including one which had lain misidentified as a plaster copy in a museum in Doncaster for decades. This is a phenomenal achievement for someone without an academic background in the subject who literally taught themselves through sheer passion and determination. Dean has published numerous papers, two books “Fossils of the Whitby Coast” and “Dinosaurs of the British Isles” and is currently working on his PhD at the University. He is a strong advocate for communicating science with the public and regularly appears on television, most recently as series advisor and recurring on-screen expert presenter for ITV’s Dinosaur Britain. On winning the award Dean said "it is a great honour to be among the recipients of this year's JCI Ten Young Persons Competition. The other recipients of the award each have an incredible story and have achieved so much, so I am very proud to have been recognised among such a wonderful bunch of individuals. I like to think that my story can help to inspire people of all ages and abilities to continue to pursue their dreams and aspirations." The winners collected their awards on Friday 24 November at the TOYP Awards Ceremony which took place at the Grand Harbour Hotel in Southampton as part of the JCI UK National Convention 2017. The winners will go on to represent the UK in the international TOYP competition in 2018.